Salvias are wonderful companions in the mixed border, providing the truest blue and brightest red flowers of any group of plants. The red ones, particularly those with long tubular flowers, are ideal lures and major nectar sources for many species of butterflies. Many of the tender salvias begin to bloom in July and August, while others wait until September and early October to provide a burst of exquisite color that lasts until the curtain comes down with the first hard frost. 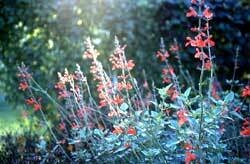 Call them salvias or sages-the two common names are often used interchangeably to refer to the entire Salvia genus. Both are derived from the Latin word salvus, meaning "safe," "whole," or "health"-a reference to the healing properties of some species, especially Salvia officinalis, the common sage. This lilac-blue-flowered salvia was a mainstay in medieval apothecary gardens and is still grown today in herb and vegetable gardens as a flavoring, medicinal cure-all, and ornamental. Salvias belong to the Lamiaceae, or mint family, and compose the largest genus in that family. They have square stems (that, with age, sometimes become round) and opposite leaves. Their flowers, which are borne on terminal spikes, generally consist of colorful tubes with two lips of unequal length, the lower ones usually spreading. These flowers emerge from calyces, or whorls of sepals, which are also two-lipped and quite colorful and ornamental in their own right. 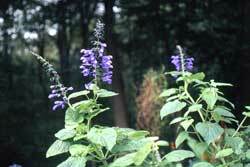 Roughly 900 salvia species have been documented worldwide, over half of them native to the Americas. If you are looking for rich scarlet flower color, then look no further than this devilish cultivar of Salvia blepharophylla, a Mexican native. Planted out after frost, it grows to two feet tall and blooms from late August to frost. Its lance-shaped lustrous green leaves, suffused with purple tones, create an attractive foil in the front or middle of a border. The loose, bushy plant is native to high elevations in the Mexican Sierra Madre. It grows to four feet tall and benefits from some judicial staking early in its growth. Its triangular leaves are extremely gummy and will stick to you like Velcro, so be careful when handling or weeding around the plant or you might accidentally break off stems. Tuck it in among other perennials in the middle of the border and let it be. Gardeners may be most familiar with this rapid-growing cultivar of the popular Brazilian native salvia. It sports dark red blossoms that dangle from a burgundy calyx. Yellow-green leaves with saw-toothed edges give the plant a very leafy look. It rises four to five feet tall and blooms from August until frost. I like to let it weave and cavort in my red border with Rosa glauca, Eupatorium maculatum (joe-pye weed), and the green-and-white-striped foliage of Calamagrostis x acutiflora 'Overdam'. This selection from Mexico grows three to four feet tall and forms a bushy mound of enticing, pineapple-scented foliage. Hummingbirds adore its salmon-pink flowers, which open in mid- to late September and continue until frost. Native to arid regions of Texas and Mexico, this plant grows beautifully in dry, well-drained garden soil. 'Dark Dancer' sports delicate, deep fuchsia flowers that dance atop wiry stems. It grows into a two- to three-foot-tall shrub covered with small, two-inch, paddle-shaped leaves. In Zone 7 it can sometimes behave like a true perennial. Looking for a hot flower color the likes of raspberry sorbet or-you guessed it-mulberry jam? Then try this relatively new selection of the roseleaf sage, another Mexican native. 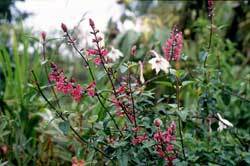 It offers graceful spikes of striking dark fuchsia-pink flowers and calyces held upright on thin, woody stems. It begins to bloom in mid- to late August and will grow four feet high in sun or partial shade. S. 'Waverly' rewards you with fuzzy white flowers blushed with pale lilac-lavender and cupped in beautiful maroon-tinged calyces. The long, 12- to 20-inch-high flower spikes bloom steadily from midsummer until frost and sparkle at dusk and on moonlit summer evenings. 'Waverly' grows up to four feet tall and has an elegant, upright form and crinkled, sage-green leaves. This is a lovely plant, recently introduced by the UC-Santa Cruz Aboretum. Similar in habit, its fuzzy lavender flowers are contrasted beautifully against deep smoky-pink calyces from August until frost. It grows four to five feet tall by the end of the season with great elegance and distinction. A regal hybrid of S. guaranitica and S. gesneriiflora, this salvia blooms with large, true purple (not violet-blue!) flowers along robust four- to five-foot-high stems from August until frost. Its large, mint-green leaves produce a look and texture similar to S. guaranitica. Its tall, leggy stature can lead to stem breakage if the plant is not staked or supported by other bushy perennials.